Visitors to the Two North Riverside Plaza website learn that we market the 83-year-old Art Deco office property as “A Current Classic.” And, we should. Two North Riverside, which commands a prominent location along the Chicago River in the West Loop, was designed by the legendary architecture firm of Holabird & Root. When completed in 1929, the tower was the first property of its kind in Chicago to feature a public plaza and was the first building built over railroad track air rights. 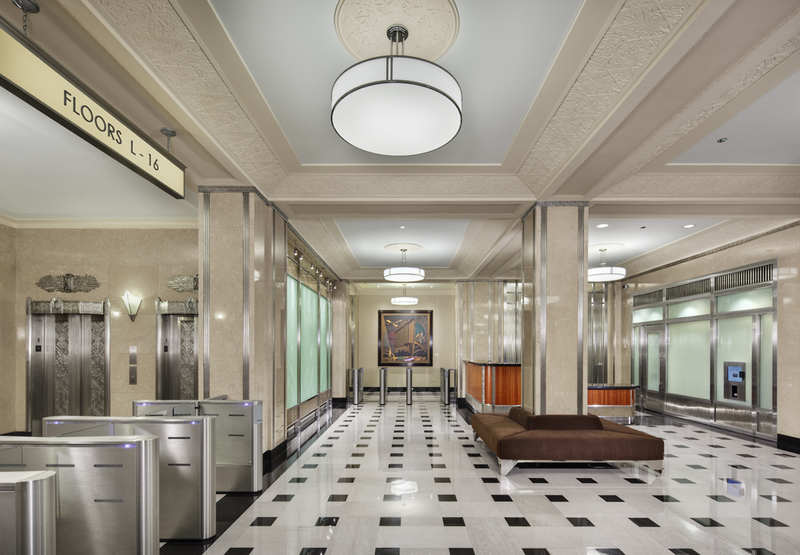 The lobby at Two North Riverside Plaza was renovated to preserve its classic materials and features. 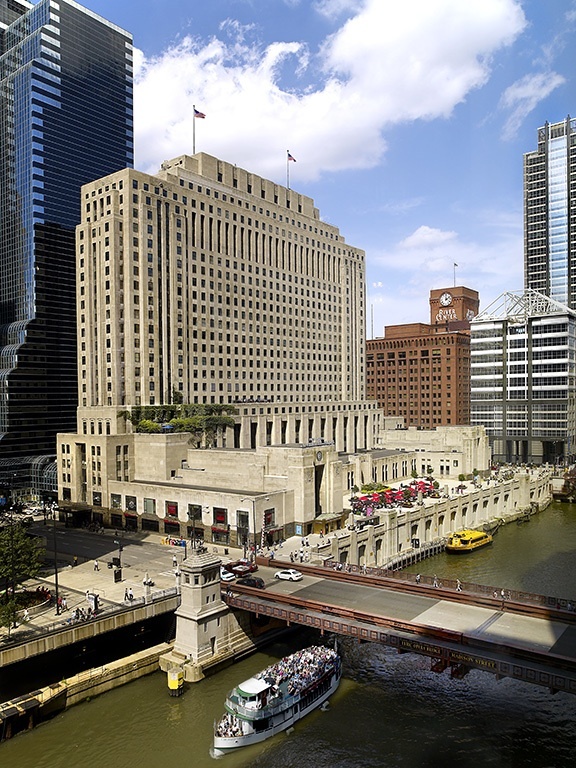 To keep the property competitive in the Chicago office market, the building underwent an extensive renovation in 2009 that included installation of a new security system, upgraded building systems and modern elevators. The lobby and other common areas were completely restored to showcase and preserve the classic materials and features installed when the property first came on the market. Today, we have entered the second phase of a program to keep Two North Riverside Plaza at the forefront in downtown Chicago; recently, we earned the Leadership in Energy and Environmental Design (LEED) Silver certification! Our decision to seek LEED Silver in the Existing Buildings: Operations & Maintenance category is testimony to management’s ongoing commitment to do what is right for the owners, tenants and environment. In fact, support from tenants and their ongoing involvement were critical factors in our LEED initiatives. Two North Riverside Plaza was the first Chicago office property built over railroad air rights. Management contracted Chicago-based consulting firm Goby, LLC to guide our LEED Silver application process. Many tenants participated by assisting with commuter transportation and occupant surveys, and by taking part in the continuing education programs we offer on energy savings and sustainability. In fact, tenants requested updates on our LEED progress and some have even made it known that earning LEED certification is a factor in lease renewal decisions. Two North Riverside Plaza set a standard when it opened more than eight decades ago. We’re confident the physical renovations completed and the LEED Silver certification will help us preserve that standard for the next eight decades. Has your property made the decision to pursue LEED certification? Did tenant support factor into the decision? Please share your thoughts. This entry was posted in Green, Property Management and tagged A Current Classic, Chicago-based consulting firm Goby LLC, earning LEED certification is a factor in lease renewal decisions, Existing Buildings: Operations & Maintenance, Holabird & Root, Leadership in Energy and Environmental Design (LEED), prominent location along the Chicago River, the Chicago office market, Two North Riverside, Two North Riverside Plaza, Two North Riverside Plaza website. Bookmark the permalink.